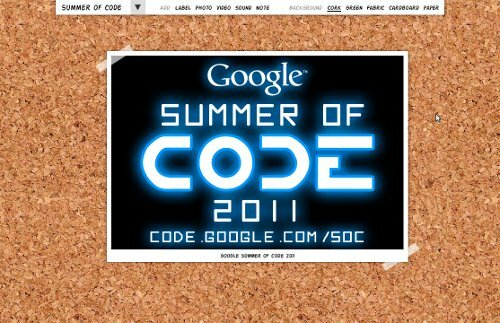 As you probably know by now, GNOME has been accepted as a mentoring organization in Google’s Summer of Code 2011. Student applications period started yesterday! If you’re a student excited about GNOME, have a look at our wiki page for more information and project ideas! Application period ends on April 8. This year I decided to mentor one project related to The Board. The idea is to implement a Tracker storage for the app. Using Tracker will allow us to implement smart searches in the app itself and expose The Board’s data to other desktop components. So, if you’re a student looking for an interesting project to hack on as part of the Summer of Code this year, this is an exciting opportunity to work on a cool app using bleeding edge GNOME technologies (Clutter, GTK+ 3, Gjs, Tracker, etc).